Once you’ve convinced your boss and colleagues that a productivity tool actually makes sense, you would probably end up using Podio. Don’t get me wrong. There are tons of great project management & productivity software out there. Trello, Asana, Blossom, just to name a few. And Podio. 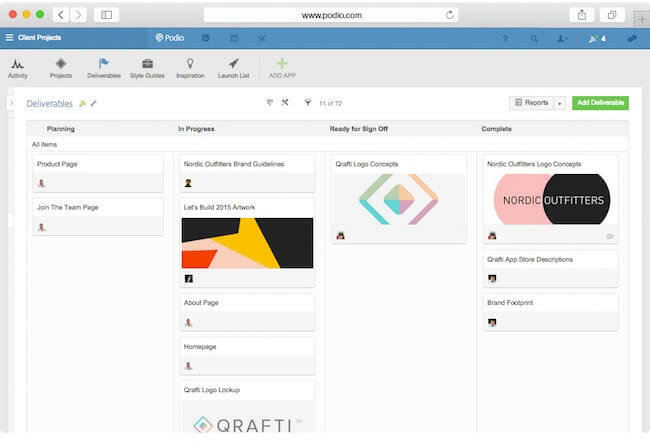 Do you wonder how you can get the most out of Podio as your main productivity tool? The answer would be to integrate it with a feedback tool such as Usersnap. Why? Go and read on. Podio is a collaboration platform for managing teams, projects, products and anything else you need to manage your business more effectively. The great thing about Podio is its flexibility. Podio can and should be adjusted to your personal needs. Doesn’t matter if you’re using Podio for certain projects or for a whole company. Everything from task tracking to meeting, notes and collaboration with colleagues can be stored inside Podio. Podio as your central hub? 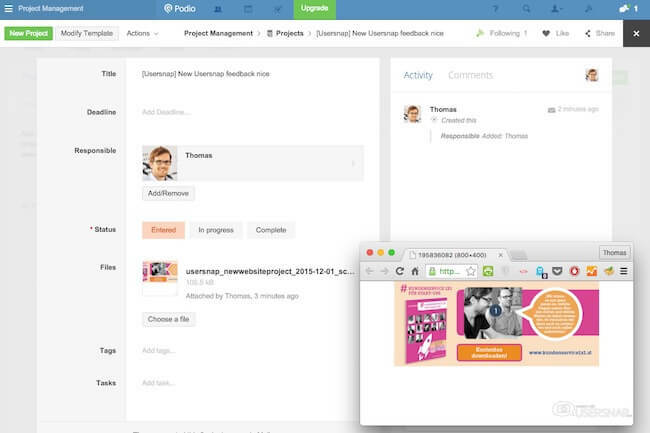 Podio aims to be your central working hub. So everything work-related can take place inside Podio. And I have to admit, it’s a pretty powerful collaboration tool for managing projects and products. And with its great range of available Podio integrations you can do even more awesome things with Podio. Since you’re probably already familiar with Podio or are already using it. I’d like to focus on the area of bug tracking & collecting feedback inside Podio. So you might wonder: Why should you collect feedback from website visitors and clients inside Podio? Well, since you’re probably storing all other work-related information inside Podio, why not keep feedback & bugs in one place as well, instead of jumping between various tools? For collecting feedback & bugs from website / app visitors, colleagues or clients, I recommend connecting Usersnap with Podio. With the Usersnap feedback widget, you never have to ask your client or colleague for a screenshot of a certain bug again. You just get them automatically delivered via Usersnap to your Podio workspace. How to set up Podio for user feedback & bugs? 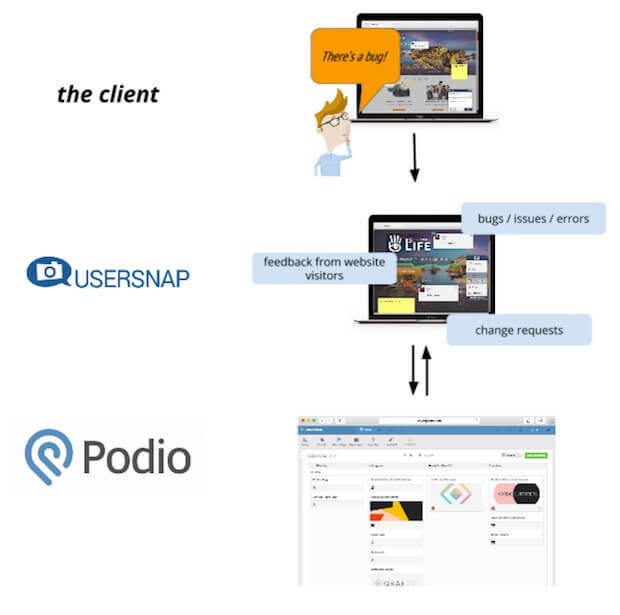 After adding the Usersnap feedback widget to your site or installing the available browser extensions, the next thing you need to do is to connect Usersnap with your Podio workspace. It’s super simple. If you’re using an existing Podio account, Podio allows you to send new tasks via email to your Podio projects with a custom email address. So we just need that email address for connecting with Usersnap. Here’s how you get it. Create a new bug tracking workspace or choose an existing one. Be aware that this will be the project where you will start receiving all website feedback and bugs. Click on the project settings “email to app” option and a new window will pop up displaying a custom email address. After setting up that Podio / Usersnap integration, you can now start receiving bug reports and feedback from your website visitors or clients. All tickets will automatically be forwarded to your Podio projects. Let me know in the comments on how you use Podio! This article was brought to you by Usersnap, a visual bug tracking and feedback tool for every web project. Say hi on Twitter.